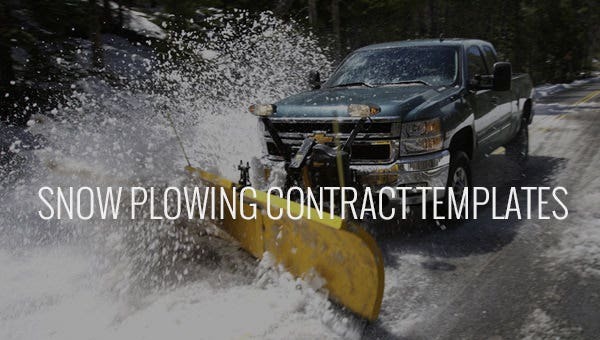 If you are running a snow plowing business, writing a contract of agreement between you and your clients can be a great way to work efficiently. 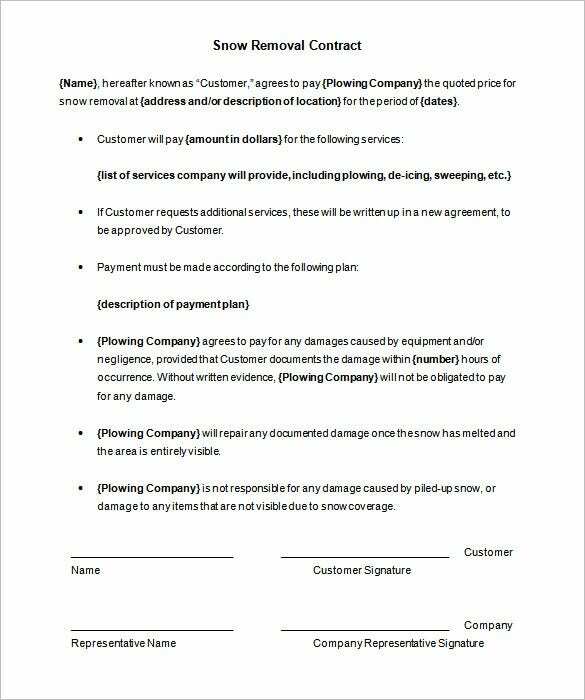 You can download and use the snow plowing contract template, to create a legally binding agreement between your business and the buyers of your service. You can also see Contract Templates. Snow plowing is not just about a heavily clad boy in a snow neighborhood clearing snow for a client in the neighborhood to earn a fortune. It is a lucrative business, which if taken seriously, could make a big and better business and eventually a better career. If you own a business agency in snow removal, then you must make annual contracts with your clients. 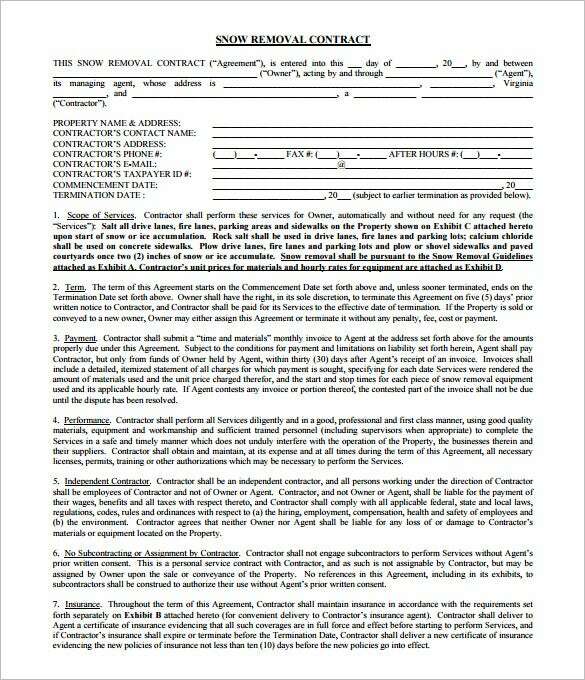 For renewing the contract you can download this simple snow plow contract for renewal agreement. Just customize and print it for your use. 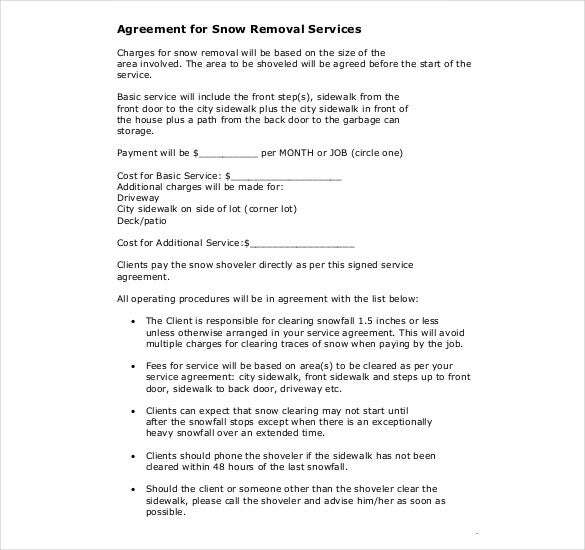 This snow removal contract template free in PDF format should be downloaded by you if you have a snow plowing business. 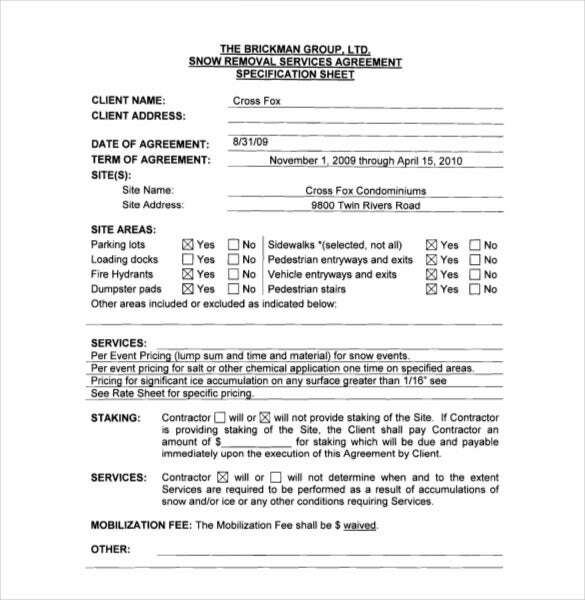 Customize with your details, edit the agreement clauses as and when you think needs change and then take the printout. 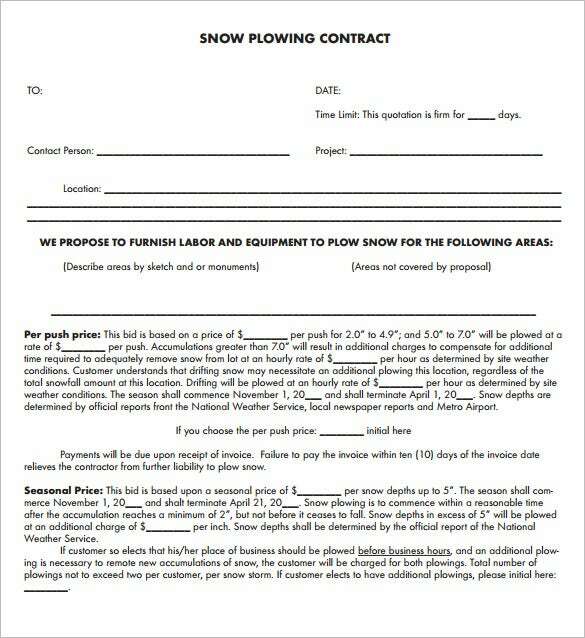 For making the annual maintenance contract form for your business in snow plowing, you must download this free snow removal contract forms template. Fully customizable, just edit the terms and conditions, change the company name and then print and use. 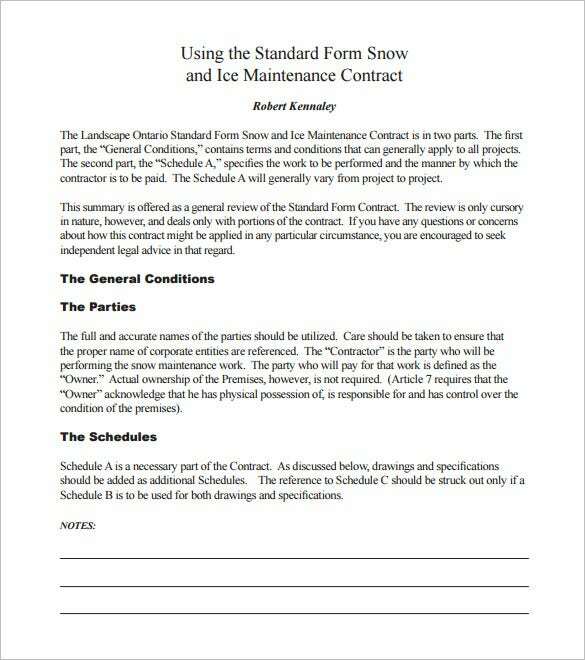 For business owners who are into snow plowing, making a contract form for your customers is extremely important. 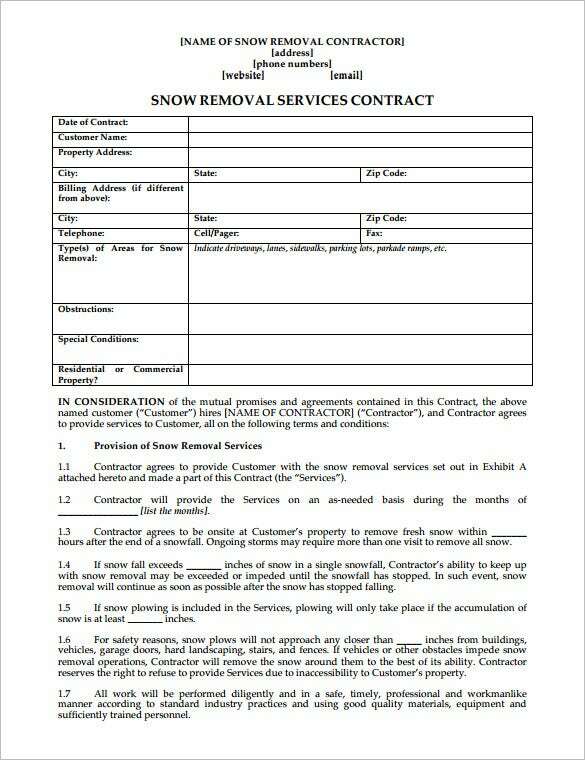 Just download this basic snow removal contract template, customize and edit the content wherever it is necessary and take printout of the form. 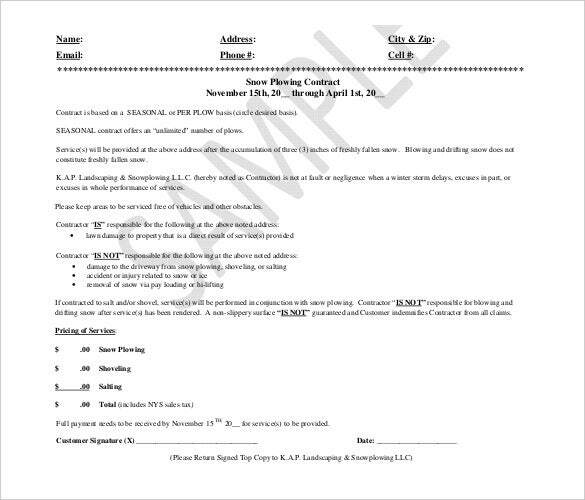 For smart business owners of snow plowing type, If you always think as, how to write a snow plow contract, then probably your answer lies with this snow plowing and landscaping contract template. Edit the content and take the printout in paper. If you run a business which does the work of snow plowing in budget, then probably you can surely opt for this affordable snow removal contract template. Customize the template with your company details, Change the guidelines if necessary and print. 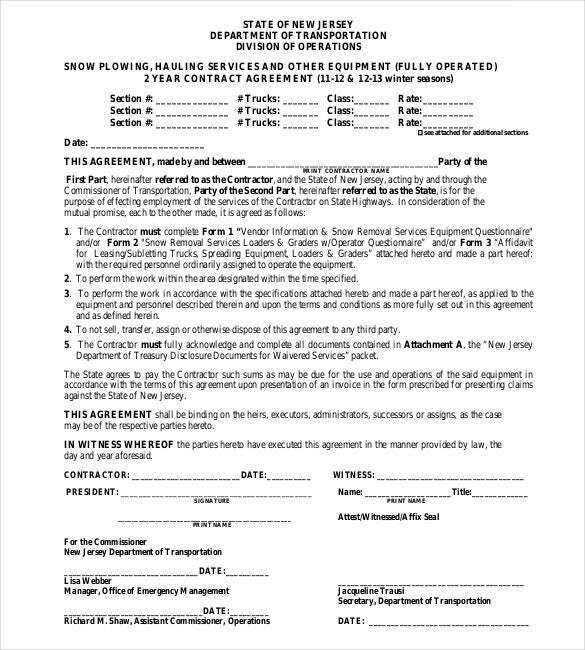 For your snow plowing and hauling business services, you can download this sample commercial snow removal contract resembling exact the New Jersey transport department’s official agreement form. 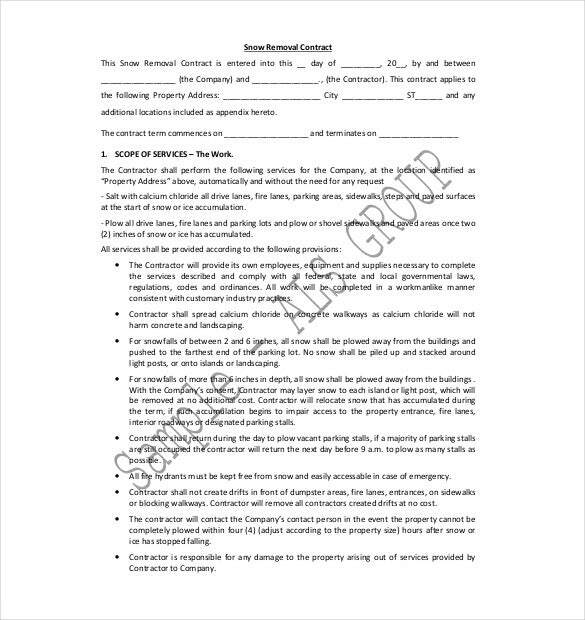 Change the clauses if necessary and use this template as your official contract agreement. 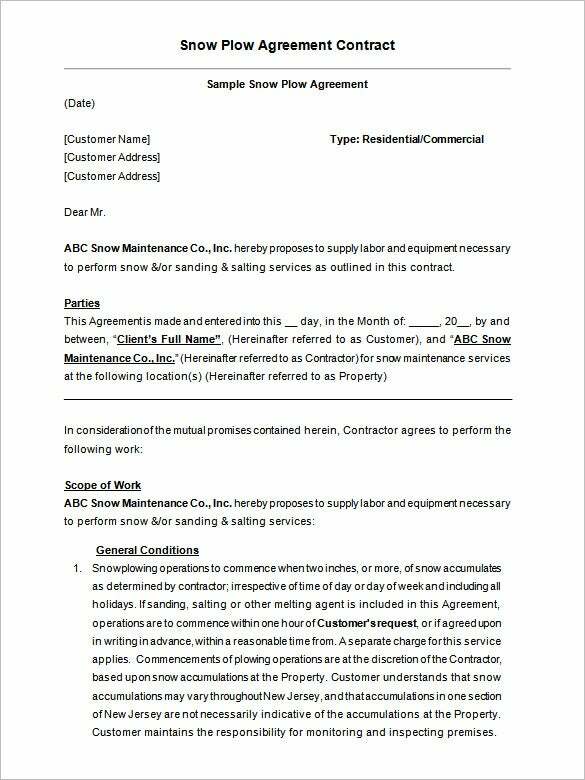 For creating a commercial maintenance agreement for your snow plowing business, you should definitely download this commercial snow plow contract template. Fully editable content, replace with your details and take the print out and use it for your customer contract agreement needs. 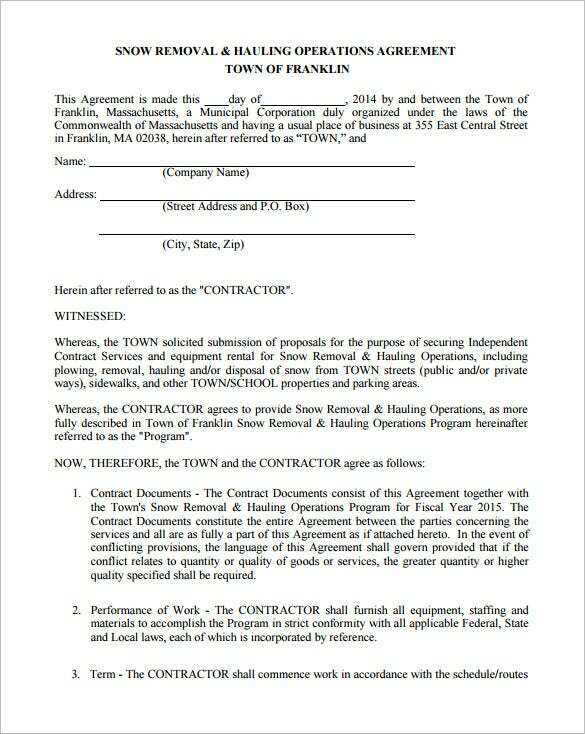 Another important template of basic snow removal contract template is very much necessary for creating maintenance contract agreement papers. Fully customizable, just edit the content and provide your company details, the service rates and add and remove clauses if necessary and print to use. 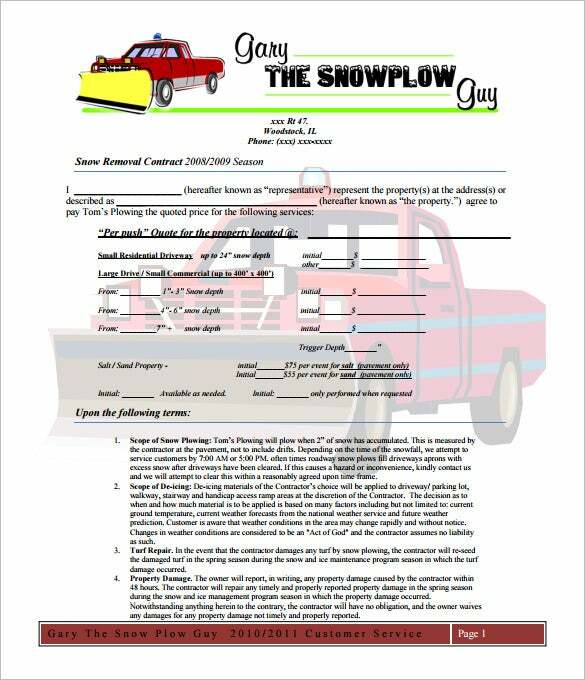 Available in PDF format, this snow plow contract template can prove to be extremely beneficial for those people who are into snow plowing business. 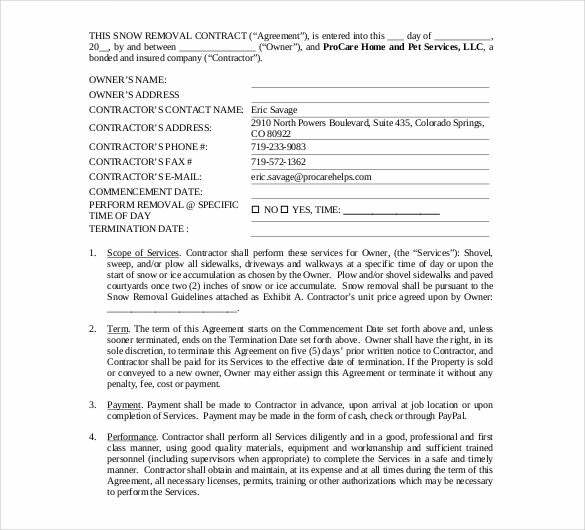 Make contract maintenance forms, by using this template. Customize the content with your own company details and use. 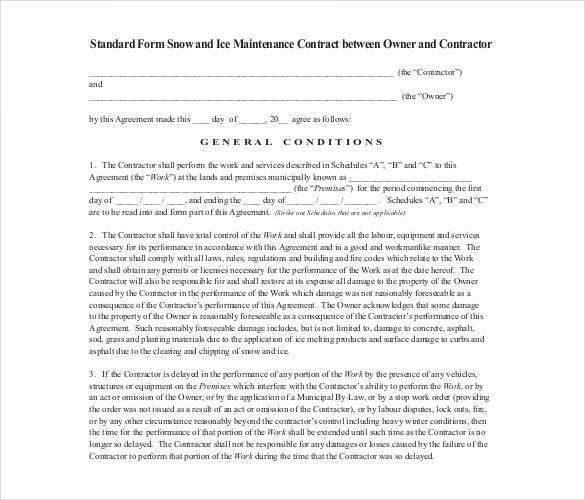 For owners of snow removal and plowing businesses, this template should be downloaded by you free of cost for creating maintenance contract agreement forms for your customers. Customize the template by editing the text content with the details of your company. If you run a snow plowing or removing company, then examples of snow removal contracts can help you a lot. 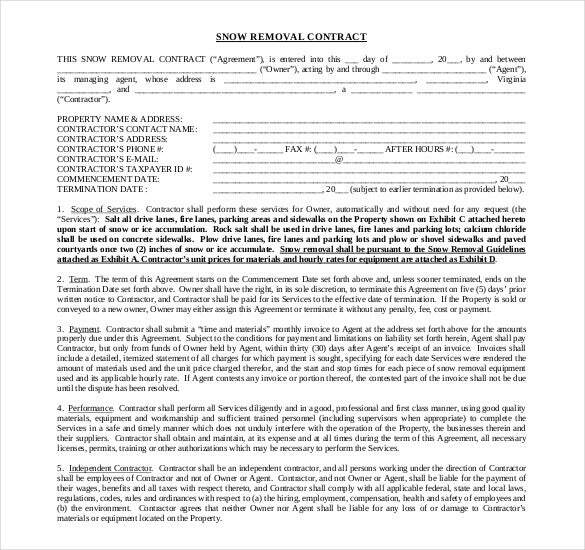 Download this sample commercial contact template, and create an up-to-date form containing all the details, and the terms and conditions. 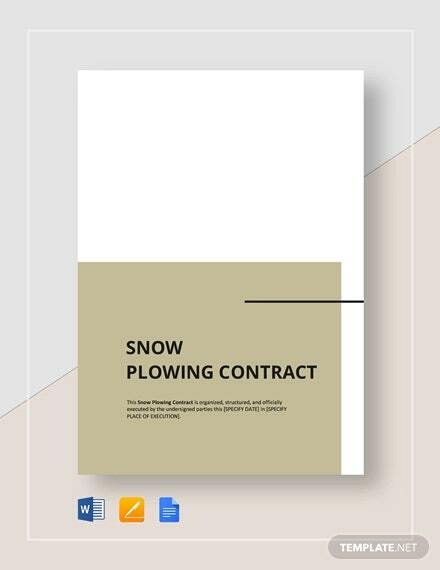 Available in Microsoft Word format, this free editable snow plowing contract template can prove to be really helpful, if you have a snow removal company. Edit the text content with your company details, add or remove agreement clauses and take the print out and use as form. 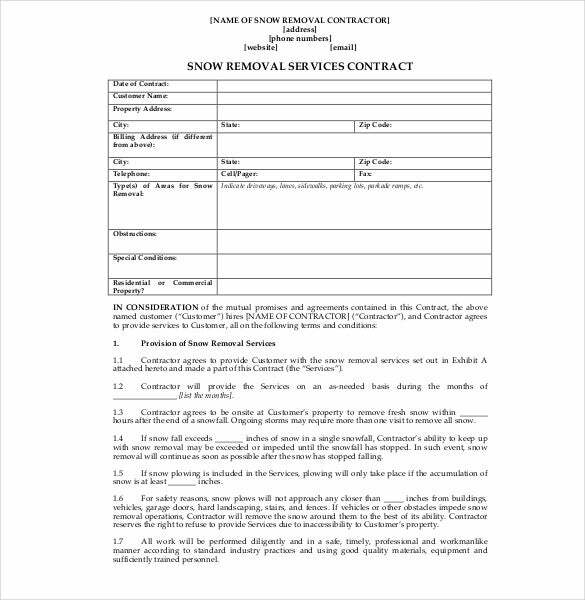 Absolutely print ready, download this free snow removal contract template into your system if you are into snow plowing business. Edit the text content, explain your service clauses, provide your company details and also mention your charges and take printout for use. 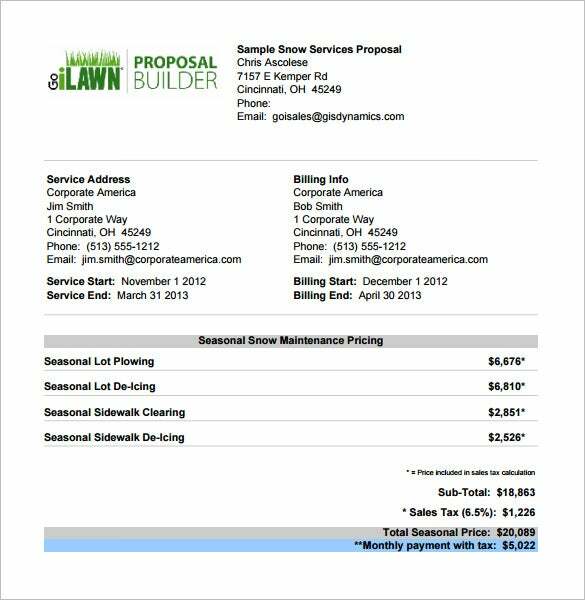 This template can both be used as commercial or residential snow removal contract template, best for business owners of snow plowing and maintenance companies. Download it for free, and customize it by editing the text content with your company details and then print. Payment terms, usually depending on the nature of work and loan contract. You and the client(s) should put a signature on the contract to signify that it is legally binding. Snow plowing and maintenance services are a regular need during the months of winters. Running a company which works for snow removal can prove to be beneficial. 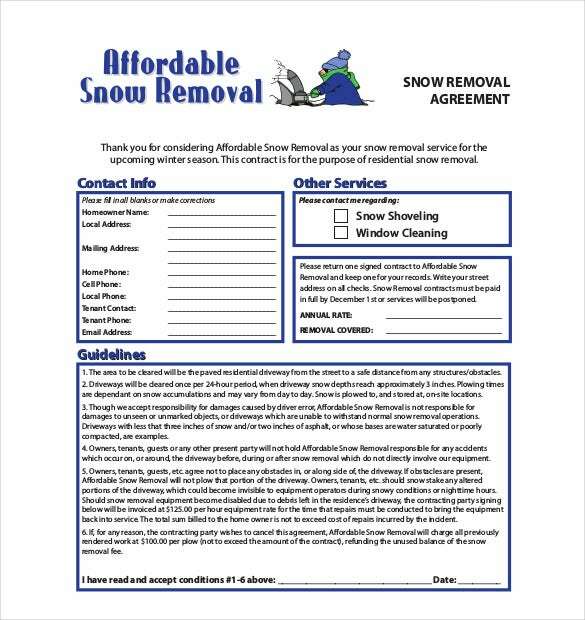 Browse through our collection of templates designed for snow removal contract forms, customize and edit with your details and then take print out for your customer’s annual maintenance form requirements. If you have any DMCA issues on this post, please contact us!